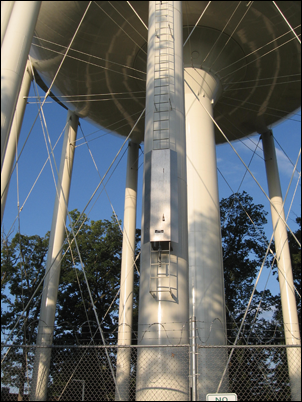 In 1976, R B Industries began to manufacture and sell the unique Ladder Gate® Climb Preventive Shield, used to control access to fixed ladders on tanks, towers, buildings, bill boards and other high structures. Since that time, R B Industries has furnished the Ladder Gate® to satisfied customers throughout the United States including Hawaii, plus Puerto Rico, and Canada. The patented design of the Ladder Gate® is effective in keeping unauthorized people from climbing fixed ladders, to control vandalism, eliminate injuries, and to minimize your liability. The shield (8' high x 1/8" thick) is constructed of aluminum so that painting is not needed. The angled sides enclose the ladder to prevent reaching around the shield. The hardware (hot dipped galvanized) enables Ladder Gate® to be installed on most fixed ladders regardless of their construction. Each Ladder Gate® unit is complete and can be installed without cutting, welding, or alterations - only a 3/8" wrench is needed. For further information, technical support, price quotations and to purchase, please go to http://www.emperenterprises.com/. Fabrication Shop, Warehouse and Shipping located in Greensboro, North Carolina.